Peelaway® 7 Paint & Varnish Remover is a water and solvent-based paste which is formulated to remove more modern water-based coatings. Excellent results have also been achieved with combinations of oil and water-based coatings. Peelaway® 7 does not require neutralising and can be repainted within a few hours. Peelaway® 7 removes multiple layers of most modern industrial and domestic paint in one application. Easy and safe to use: has very little odour and naturally degradable. Safer to use than traditional Methylene Chloride paint strippers. The unique paste formulation works effectively on the most intricate projects. Effectively removes paints from woodwork, plaster, bricks, masonry and metal. 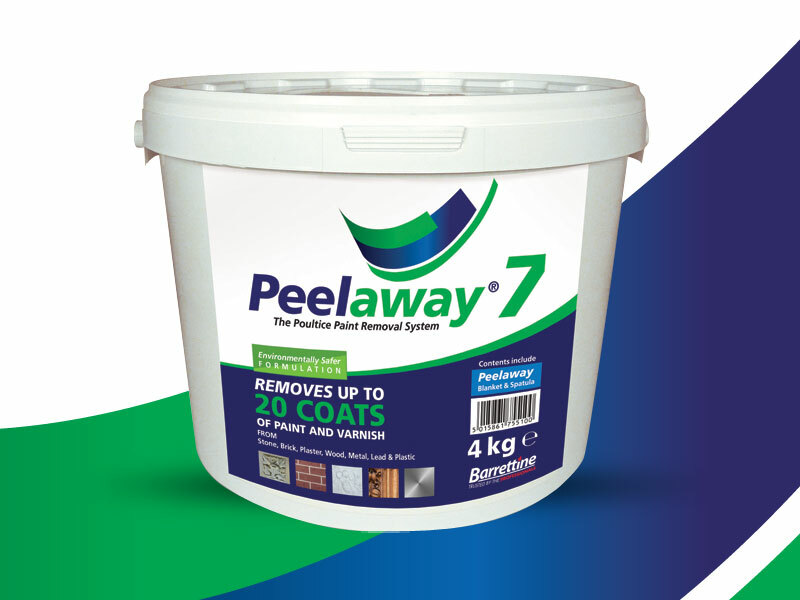 Peelaway® 7 is recommended for use in removing paint from veneers, plywoods or aluminium and is much safer and more user friendly. It is non caustic and does not burn skin in the event of accidental contact. Peelaway® 7 should not be used on certain plastics such as polycarbonates and perspex. (Test on unskimmed drywall). Always carry out a test patch first. We can not state enough how important it is to carry out a test patch before general use. The size of the test patches will depend on the subject matter, but as a guide they should be from 75 x 75mm up to 300 x 300mm. Apply Peelaway® paste graded from 1mm to 6mm thick according to the age and thickness of the coating (e.g 1mm when removing a thin layer of varnish but possibly up to 6mm where there are multiple layers of thick paint). Place the Peelaway® blanket (print side out) on to the paste. Rub gently to remove air, pierce bubbles where necessary. Allow to stand from 2 to 48 hours, again this will be determined by the paint/coating type and thickness/number of layers. When using Peelaway® 1 to remove heavy paint build up over plaster mouldings you may need to leave even longer (up to 72 hours) and this can often aid the drying out process which encourages the old paint and blanket to lift away from the substrate being treated to complete the stripping process. For areas involving different elevations several test patches should be applied to accommodate the possibility of different coatings and the effects of weather on exterior surfaces. To remove, the spatula should be inserted into the paste and a section gently lifted away. If the original surface is apparent, the test patch can be removed and the surface wiped with a damp sponge. If paint can still be seen, the test patch should be replaced and re-examined after a few hours. Once the correct paste and timing for the project has been established together with the thickness required, the designated paste should be applied, the Peelaway® blanket laid over the paste and left for the time indicated by the test patch. Full instructions are on the containers. Each project can potentially give different results and this is why it is imperative to carry out Test Patches. Leaving on for not long enough could mean the process has not completed. Leaving on too long could damage the substrate or you may find the Peelaway® blanket and paste becomes too hard and difficult to clean up. Peelaway® is architecturally specified; approved for projects by English Heritage, National Trust and many contractors working in the heritage industry. The Peelaway® Poultice Paint Removal System has been used for many high profile restoration projects including railings and interiors at The British Museum, ornate plaster ceilings at Greenwich Palace, ironwork on the London Underground and delicate panelling at the Victoria and Albert Museum. The system is frequently specified by architects as the only appropriate solution for paint removal where damage to the surface or risk to the environment is an issue. Peelaway® stripping pastes are designed to be applied with the spatula supplied. Alternatively a hawk and trowel, brushes or a roller can be used. The pastes can also be sprayed with the use of the correct equipment: details are available from the company’s technical department. The method of application will depend on how thick the paste needs to be applied, for instance, a spatula or trowel will apply the paste thicker than a brush. Never presume that Peelaway® will work because there are two types for different paints. P1 is mainly for lead and oil based paints and must be neutralised after stripping (pH between 5-9, fluid supplied). Moisture containing residues of Peelaway® 1 may bleed out of the substrate at a later date thus raising the alkaline pH value once again. This could affect the appearance of the repainted surface. As a precaution if Peelaway® 1 is used and the surface is to be repainted, we would always recommend using a good quality alkaline resistant acrylic sealer/primer prior to repainting. Repaint only when the surface has dried out (below 15% moisture) and has been rubbed down. Rubber gloves must be worn. P1 may discolour some hard woods including oak; P7 should not cause this effect as it’s made differently but check first with a test patch. P1 neutralises the lead in paints so that it can be disposed of in the normal way. P7 is mainly for water based and modern oil paints indoors and out. The Peelaway® system generally does not work as effectively without the covering of the plastic blankets. These should be cut to size and overlaid as appropriate. Green for P7 and red for P1. Peelaway® 1 will work slower under 5oC and will stop working under 0oC. You can apply Peelaway® with a spatula, trowel or brush; you can also spray it on for bigger surface areas. As a guide coverage is approximately 1m2 per kilo at 1mm thick for P7. For P1 the coverage is reduced by approximately 20 per cent. Always ensure that a sample patch is completed using the twin sample pots available. Starting from 1mm and building up the depth to 4-6mm on an area of 75mm x 75mm. If the initial tests are successful bigger test patches are advised before embarking on the whole project. This will identify the following: - which type of Peelaway® to use; - how much to put on; - how long to leave it on to do the job; - it will warn you of possible damage; - it will save you time and money; - and how successfully Peelaway® will strip the particular surface. ALWAYS READ THE INSTRUCTIONS AND DO A TEST PATCH FIRST.